(Newser) – TSA screeners currently working at airports across the country are doing so without collecting a paycheck, thanks to the government shutdown. And it appears that an increasing number of them aren't having it anymore. The New York Times and CNN report that the number of screeners calling in sick is unusually high at some big airports, including Dallas Fort-Worth and Kennedy in New York. 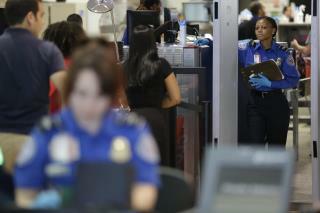 At Kennedy, for example, more than 150 TSA employees called in sick Friday morning. The big question is whether the sick-outs will increase as the shutdown continues. Mehh. ...can't say I blame them., especially given all the times the govt has shutdown in the past and the other govt workers have gotten a "Free Holiday". You can't have it both ways. If this was a nautural disaster or terrorism or act of war I could understand. But the President and congress who are getting paid cannot expect other people to make a sacrifice while they are not. Let's require a Doctor's note from this point forward.